It has been three years since I posted. The last time I competed in an event was 2011. I struggled on for a couple more years trying to find out what was wrong, as the previous posts below show. I had MRI's and appointments with surgeons. In the interim, I looked for other opinions, other solutions, even tried cycling. Cycling hurt almost as much, and it just wasn't as compelling as running was. I had another MRI recently, and another consultant appointment. Net outcome, it's the same, just worse. I have a small disc bulge, which isn't major but it makes cycling very painful. The main issue is I have a Pars defect. This is a healed fracture of my spine. No idea when I broke my back; but I did. This resulted it excess wear on the L5/S1 disc. The L5 / S1 disc has degenerated. It has now degenerated considerably more than the MRI in the previous post shows. You can now see pain signals on the vertebrae themselves, and what little running I could do a few years ago has now ceased. There is no magical cure. The disc have no blood supply to them, so it will never grow back to the size it was. Research into experimental stem cell treatments have to date been unsuccessful as the cells don't stay alive as there is no blood supply to the area. The rest of my discs are wonderfully healthy. 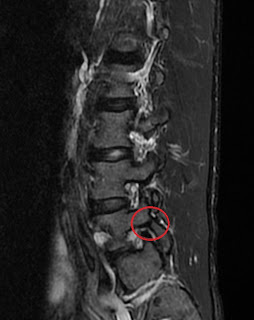 The only "treatment" is a serious operation; typically entering via the stomach, to take out what is left of the disc and fuse the L5 and S1 vertebrae together with a metal pin. This is something they do for people who can't work, or can't sleep with the pain. That will come in time, but it's not where I am yet. Getting out of bed is a bit of a struggle, and initially moving around is painful, but once it warms up I'm ok. Sitting down hurts after a while. I can walk with mild discomfort; feels like I have tight hamstrings all the time. I can't run very far, a mile or two. So, it's manageable for now. I can still walk in the hills and get out and about, and I'll have to take that. You never know what medical progress will bring, but I think the kind of breakthrough I need is some decades away. I am enjoying organising my own events (Beyond Marathon Ltd) and my GPS Tracking (Race Drone), and that's what I have to satisfy myself will. So, there is no fairytale ending to the story. I had half a dozen years in the thick of ultra running, and it took me to some amazing places. Maybe I can go and walk a few more; we'll have to see. It's been semi-official for some years, but today's appointment really closed the door on running. I'll keep my fingers crossed, but I'm not waiting for a miracle anymore. That is some kind of closure. Keep running while you still can! I had an appointment with an anaesthetist on Tuesday, regarding a pain management program. I took along the diagnosis from the spinal surgeon, which suggests 3 different injections; a right-sided pars block, l5-s1 facet joint injection, and a caudal epidural. The anaesthetist agreed with the diagnosis that I have disc degeneration disease (DDD) of the L5-S1 disc, but believes that if I have all 3 of those injections we will not actually find out what my pain causality is. 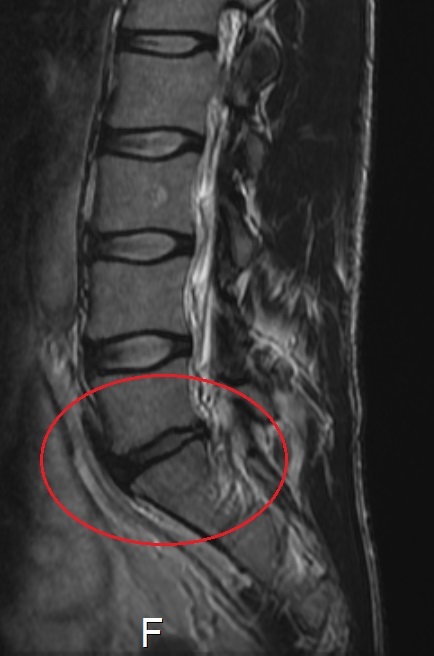 The DDD in my MRI is very clear, with the thinner and dark lumbar disc very much evident even to my untrained eye. I also have a disc bulge, which at the moment is not too large, but could (and will likely) worsen in time. He did however also point out a few other anomalies in my facet joints, differences in muscle mass, and also put forward a suggestion that my DDD could potentially have caused impingement syndrome, which as I understand it, is that the collapsed disc is sitting on, or interfering with, a nerve around my Sacroiliac joint (SIJ). This could be the cause of the acute pain and muscle strength fatigue and failure as I run. He advised that this was only another theory, and it was also difficult to treat. Possible long term management include an even higher orthotic in my left shoe to try and lengthen my left leg and easy any pressure on the my right side SIJ. He suggested rhizolysis could be a potential treatment. This is an unpleasant sounding treatment where a probe is inserted into the spine, guided by x-ray until it is in contact with the nerve causing the problem. The probe is then heated, to essentially kill the nerve signals, shutting off the pain. There are of course other nerves in the area that carry muscle movement signals, so you have to be very certain you have the right nerve which only kills the pain signals. I have read around and this treatment is partially or fully successful in 60-70% of patients. I believe that the procedure is carried out using a couple of doses of local anaesthetic into the area so the probe can be heated with manageable pain. For now all of those treatment options are potentially months away. For now, he has suggested I have a series of steroid injections to try and isolate what is causing my pain. The first injections will be on 28th may into my right side SIJ. Regardless of my long term future running, which admittedly looks somewhat bleak at the moment, I have been researching road bikes. Even if I am somehow able to bring the pain under control, I will have to change my training structure. I want to be able to run ultramarathon’s but I would realistically have to train for them by predominantly cross training long distances on a road bike to retain my endurance, and also doing more strength and flexibility work. This may allow me to still run short distances in training, and I hope, still participate in some long distance events as a runner. 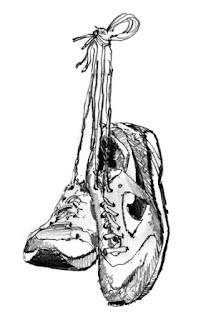 I’m going to try a run a 3.5 mile fell race this evening. The first time I have tried to run that far for weeks and weeks. It’s very hilly too, but I figure it can’t really do he a lot of harm. I may be dreadfully unfit at the moment, so it will do something for that at least. That is the primary injury, though that occurred years ago. 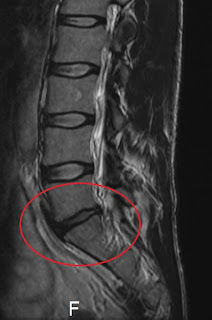 But what I have now, likely as a result, is Lumbosacral disc degeneration disease (DDD). Basically, the disc is not as thick as it should be, it is thinner, more dehydrated (it's darker in colour). Look at the nice thick whiter discs above for a comparison. Consultant explained healthy discs are usually like crab meat and 85% water. If they degenerate they turn dark as they lose water content, and get thinner. You can see it circled on this different type of MRI scan. DDD happens to pretty much everyone as they advance in age, but my old injury plus my running has accelerated mine. This combo is what is giving me low grade lower back, buttock and hamstring pain all the time. The pain increases as I run to about 10 miles, at which point I effectively sieze up and struggle to shuffle along. Ultimatey the disc collapses in time, and then the pain can go away. That however will take the next 20 years. So I will be a pin free 60 year old at least, and resume my ultra running career then perhaps? Well, I'm not quite ready to give up yet, so what are my treatment options. If it was so bad I could not get out of bed then I could have the disc removed and the vertebrae fused together. This might work, but in 5-10 years it would put so much stress on the other disc that the same would happen and I may end up worse. Because I am still able to walk and run short distances without too much pain, then surgeon says I am not a case for surgery, and I agree with him. So what's left? Combo of two steroid epidural directly into the spine, periodically. It's just a temporary fix to settle it down and would potentially need repeating every 6-12 months if it works. I can als try some ongoing chiropractic, hamstring stretching and back strengthening to help ease the symptoms. It's my hamstrings that murder me as well as the miles pass by, so I think a solid and regular hamstring stretch routine may be called for in an effort to lengthen them. These strategies are all pain management, beause disc degeneration is not reversable, yet. I think it will be one day, but medical technology is not there yet. We'll need some kind of breakthrough, maybe stem cell repair, who knows? I found an old study where a 5-10% improvement was found by taking Gluco and Chondr supplements, but that study is hardly statistically significant, being a case study of 1. I've always been very skeptical about the benefits of taking those two, but I guess it can't really do any harm can it. Oh, there is one more option. I could take up another sport. Cycling or swimming! I'll bear those options in mind while I book in for an injection pretty soon and see if that settles this down. Maybe I can eek out a few more years. If not, then I could end up one of those MAMIL's you have read about (Google it). Despite this very bad news, I remain optimistic about my chances of returning to long distance running by using a combination of the strategies outlined above. However, I also have race directing to keep me occupied. 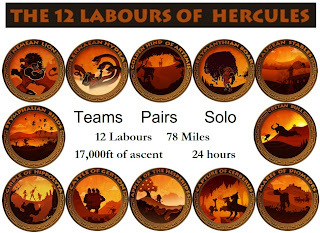 Dusk til Dawn Sunlight takes places in 6 weeks, and The 12 Labours of Hercules takes place in July. So, it's not all doom and gloom and it looks as though I finally know what's wrong, and can try and do something about it. It’s been a year since I first had ‘pain in the arse’ symptoms, and couple of months later mentioned it on my blog. 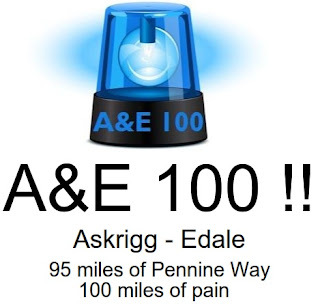 I remember running in lastyears Anglezarke Amble. I remember falling on my arse very hard a couple of times, due to the appalling conditions. I have no idea if that caused or contributed to my current situation but I am more and more suspicious that it did. A couple of months after (April 2012) that I wan the Coventry Way 40, very badly. Suffering lower bag and hamstring pain. Since then I have been more or less limited to 10-15 miles running before pain coming from my sacrum, coccyx area, slows me to a painful walk or half jog. I have pain in my right buttock all the time, when seated, when walking. Sometimes it is low level dull ache, sometimes it’s sharp. It never really goes away. When I run the pain gets considerably worse until that 10 mile mark where it’s pretty much a show-stopper. I’ve tried physiotherapy, osteopath and chiropractic with no joy. Finally I saw a UK Athletics physio, a guy I saw for my old groin injury. He referred me to see a spinal surgeon in London. The surgeon saw me for probably only 10 minutes yesterday, listened to the story, did a brief exam and said he suspects I have a stress fracture of my right SI Joint, and possibly a L5 issue. He has ordered 3 MRI scans. The scans will take place next Wednesday. The scans are, the right hip, L5 spine, and a STIR (a fat suppressing sequence as I understand it). Reports are due to go to several radiologists for analysis, then I go back to see the consultant in London in a couple of weeks. He briefly mentioned increasing Vitamin D, calcium levels and getting metabolically built up. Beyond that he didn’t outline any treatment, as at the moment he needs to see the imaging results to be certain. Having put on my internet doctor hat and read around yesterday, it seems a surprising diagnosis as it seems most fractures heal within a couple of months. Maybe because I didn’t get the appropriate diagnosis and treatment at the onset, and just tried to run through it, I may have delayed the correct healing process and caused complications? I don’t know, but I do know that it’s not getting any better on it’s own, much like the long term Gilmore groin injury I had in 2010/2011 that required (successful) corrective surgery. 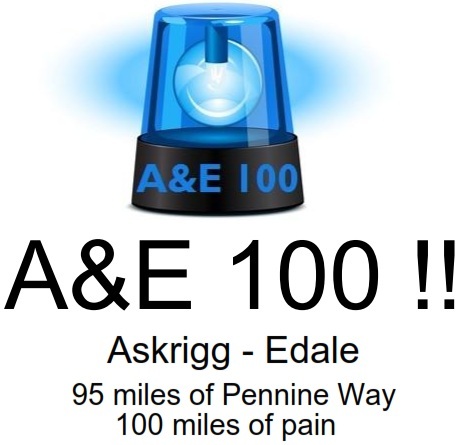 The literature online suggests ultra runners are the classicpatient to present with a Sacral stress fracture (so those heavy arse falls at Anglezarke may not necessarily be the blame). Anyway, hopefully the surgeon is onto something and I can get answers finally. 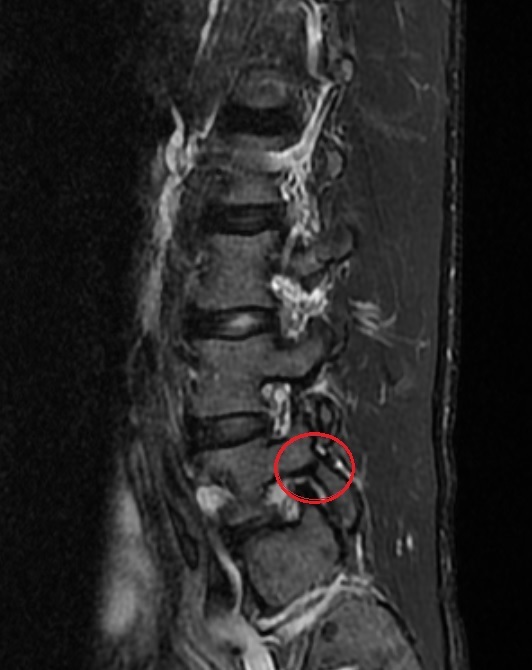 I'm continuing to work through my SI joint injury with an appointment with a Spinal Surgeon happening soon. 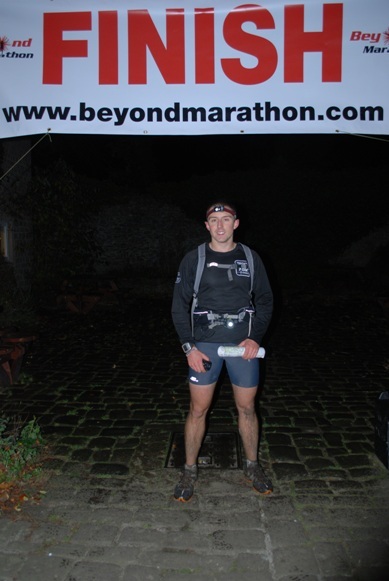 In the meantime my company Beyond Marathon Ltd have organised several ultramarathon's this year. Dusk til Dawn last October was a huge success and will be again repeated this October, with version taking place in May, called Dusk til Dawn: Sunlight. 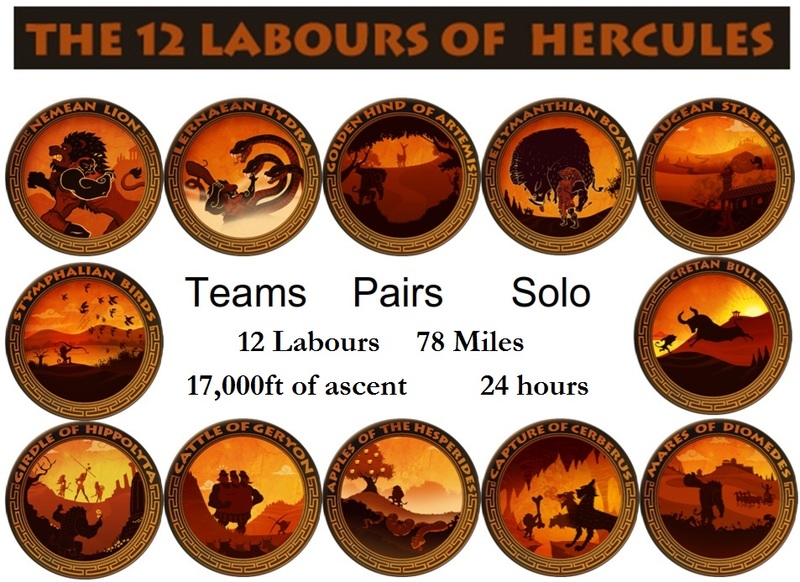 As well as that there is a totally new ultramarathon concept we've created called The 12 Labours of Hercules, which see's competitors run between 1 and 78 miles in a 24 hour period. It has elements of a mountain marathon and adventure race pure is an ultramarathon at heart! We're really excited about this, and so far the reception has been really good with bookings from some great UK ultra distance runners. I'll post an update on my SI injury as soon as I know more! So an update from the last month. As you know I’ve been long-term injured with SI joint dysfunction. Essentially I can run about 10 miles before SI joint pain, and immobility puts so much wear on the rest of the muscles in the area, and my hamstrings that I my stride length shortens to a little wobble and eventually I stop and can’t run any further. I probably caused this problem myself by effectively declaring that I would do very little in 2012. I think the core strength and flexibility I had built up in 2011 gradually faded away and left me all but crippled, in ultra terms. So, unable to run, I’ve been very miserable. These two combined meant that my relationship has suffered as I could not do the weeks we like to do together. I always said I would rehab after Dusk til Dawn which I started to do. Relationship wise, I’m not going into any further details on here, but I’ve had a really bad few weeks. Unfortunately in that time my rehab has started to bear fruit and I appear to be running well over short distances, and my speed has improved quite a lot even in the last week. If I would have been better a little sooner, then I may not be in the same lonesome position I am now. So anyway, I have been doing Pilates, Yoga and a circuit training class for about 6 weeks. This combined with a daily routine of SI joint dysfunction exercises and stretches appears to have worked, so far. Last weekend I went down to see my friends Anne and Vaughan, with whom I met on La Trans Aq in 2007, and have remained friends with ever since. 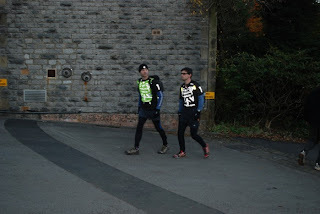 We ran a 17.5 mile trail circuit in Warwickshire, from Tanworth in Arden. It was a route they had done on a night race a few weeks previous, where barely anyone was able to reach the start due to flooding, and only 8 people finishes the course anyway. On the night, half the course has a raging torrent and they were wading up to their thighs in water quite often! The ground had certainly improved, but as you can imagine with all the recent rain, it was still very wet for the whole course, still flooded in places, and very muddy and slow going throughout. The run, walk, stumble, wade nature of the course meant that it suited my current rehab as 17.5 miles is the longest I have run for over 6 months. My SI joint had more or less had enough by the end but I had got through it and it was a big improvement. We had a lovely pub meal afterwards, and it was great to catch up with both of them. I have been doing a weekly 10k through the fields and woods by my house for the last 3 weeks. There is 1000ft of ascent and countless stiles and “rooty” woodland, and a few floods to get through. Anyway, I did it in 58:37 3 weeks ago, 57:02 2 weeks ago, and 53:04. A 4 minute improvement in one week over 6 miles in immense, as I am sure you realise. I have been doing some speedwork intervals, and 3 mile flat out speedwork, which has really made that difference to my fitness. This weekend I face a longer distance test. It’s the Wem Winter Wonderland, a Shropshire based event that I do every year. It’s getting on for 21.5 miles, somewhat longer than the advertised 20. I figure that it’s a Christmas bonus! It is relatively flat, but that is more likely to be a curse given all the rain this week, and that it is forecast rain for the rest of the week and on the day. So, it could very well be a 21 mile wade over muddy fields. Still a few of my friends are doing the race, so it will be good to catch up with them afterwards. I’m looking forward to it, despite the weather. I’ve run in a lot worse! Over Christmas I will doubtless get a few long distance runs in, and I’d like to do some hill walking too. In January I plan to do That’s Lyth on the 27th, which I have done twice before, though it was years ago. I’ve put together a rehab plan which I hope will mean I can participate in La Trans Aq in June. There should be no reason why not, as long as I stay diligent with the exercise regime. 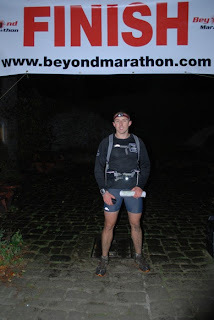 I am having the Beyond Marathon website redeveloped at the moment, and that should launch at the end of January. Look forward to showing that off to you. Planning on running several ultra events in 2013, those details will be on the website when it launches. For now I am concentrating on getting my life, and running (which seem symbiotically linked) back on track. 2013 will be a better year, I know it. p.s title is a relatively obscure 90s dance track. Answers on a postcard, or comments. Dusk 'til Dawn took place 3 weeks ago. It was my first event as an organiser. Obviously I have been a competitor in a lot of races over the years, in many countries, and those experiences have given me what I hope was a keen insight into what makes a good race. Couple that with owning the Beyond Marathon website, and having a fairly scary knowledge of the hundreds of worldwide ultras and I can cherry pick elements from one race or another to produce my own race that I hoped would have a wide appeal. So, I had an idea for Dusk 'til Dawn but it was given a purpose when Wendy my girlfriend was diagnosed with Malignant Melanoma, which is the most dangerous form of skin cancer. Wendy's diagnosis was all the more shocking because she avoids the sun all the time anyway. It was very likely overexposure to the sun as a child that caused her melanona. Her melanoma was sufficiently large (1.8mm deep) for doctors to effectively give her 50/50 for survival. She had her sentinel lymph nodes removal, and wide local excision, which means they remove a large amount of skin from around the melanoma in an effort to stop the spread. They also removed the three closest lymph nodes to the primary cancer, which is the first place that the cancer spreads too. Melanoma spreads rapidly, and once in the lymph nodes, the cancer is very difficult to treat. Secondary cancer's form in the lungs, brain or other organs and many patients die within 1-2 years. After the first operation, she was left with three missing lymph nodes which has resulted into lymphodaema (swelling) of her right arm. That's something she will always have to put up with. She has a 'shark bite'; a chunk of her upper arm missing where the excision took place. Her lymph node biopsy came back negative, which was a huge relief. However, every 3 months (for 10 years) she has to go back to the hospital for more checks to see if the cancer has returned. She then had a subsequent operation to remove more lymph nodes after the doctors found another lump. This also came back negative. She is now close to 2 years in remission, but we both still have the 3 monthly worry when the check up time comes around. Maybe this will get easier in time, but I doubt it for the time being. Anyway, she has had great support from her Macmillan cancer nurse, so I thought we could use the Dusk 'til Dawn event as a fundraiser for Macmillan Cancer Suport, to raise awareness of skin cancer. There is no sun at night to burn you, what better time to run a 14 hour race? So, that being the premise for the race, add to it a few other twists and turns; a chasing 'Grim Sweeper', and the clocks going back that night to give the participants an hour extra before dawn. So, the ideas came together and the event website was created by me. I like planning and I like attention to detail. One element of my day job involves business continuity planning and disaster recovery. Plan for the worst and hope for the best basically. My main aim was to send out up to 90 participants out at night, on a very challenging Peak District course, and return them all safely. With that in mind I wrote the race description, and a FAQ page that I hoped would give everyone all the information they might need to participate. I created electronic maps and GPS files, and then also organised recces of the course each month from June to September where me or Wendy led participants around sections. Next was finding checkpoint (CP) volunteers; people who I knew would take good care of the participants. That wasn't too hard because I know some great people! First on board was Mike Perry , a Stoke on Trent Physiotherapist. Mike has first aid training and is also trained is search and rescue. A perfect choice really! Mike was a very enthusiastic volunteer and also a great sports masseur and physio! Next we had our friends from Shropshire Andy and Yvette. Andy and Yvette are both excellent fell runners. They have started a business with their two friends Nick and Karen. Their business is Farafoot - Bushcraft, Wild therapy and Wild Running. A fabulous idea which I hope will be very successful. They are all lovely people who have a good insight into the ultra and fell running world and know how to look after people in the wild outdoors too! It was decided that they would sponsor and staff CP2 at Earl Sterndale School. Earl Sterndale School kindly opened their doors to us on a cold Saturday night and were fantastic hosts. Checkpoint 4 was another obvious choice. 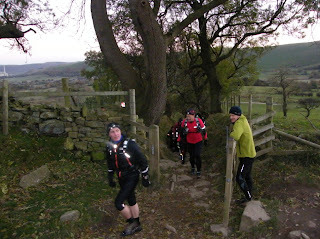 CP4 was near Cracken Edge which is a high and cold place to be on an October night. It was near the top of a steep hill, and a 4x4 vehicle would be required to pull up into the space by the stile. Wendy's friends Debbie and Aaron. Aaron was in the RAF and has had a lot of involvement in logistical planning. He also had army medical training too. As soon as Aaron and Debbie agreed to take on CP4 we knew that it would run like clockwork to the last detail, and it did. That left CP1 and CP3. I'm a bit of a fan of spreadsheets and formulas, so I had calculated that because of the race deadlines, we could use the same staff for CP1 and CP3. Who else did I know with a large 4x4? My father. Now, he had never operated a CP before, but he was very enthusiastic and his friend Tony was a lover of the outdoors, so the two of them stepped up to the plate. Now, I needed to fill the role of the Grim Sweeper, the mysterious figure who would chase down the participants during the night, as well as provide a safety net to scoop up lost, injured or struggling competitors. 50 miles is a long way for 1 person to sweep and to maintain the minimum required speed of 3.5 mph. So, I decided to split the role between 3 people. Clive Hevey, a friend of mine, who I met when back in 2005 when I was his personal training client. Clive knows the Peak District better than I do, and he is a Bob Graham Round finisher. Clive would be sweeper number 1, from the start to mile 16. Then Sweeper number 2 would be Andy from Farafoot, who I have already mentioned. Andy, far too keen as he was, didn't stop after his stint as sweeper, he carried on and joined Sweeper number 3 for his leg. Sweeper number 3 was James Love. I have done a fair few events abroad with James; a couple of deserts and Nepal in 2011. James is a great guy and very reliable. So the sweeper team was assembled. Finally, Wendy's sister Amy and her husband Steve. Amy is another person you can rely on completely. She would act as road marshal and event photographer, as well as a million other tasks back at HQ; boiling water, preparing food etc. It's a long list! Steve would be an extra vehicle, in addition to mine, to be able to react to situations on the course and head out to collect people if necessary. Steve and Amy did a great job on the night. Two late additions to the team were Daven and James, two A&E junior doctors from Bournemouth. Both are half way through a year out from their medical training to get experience in wilderness medicine. They have both recently returned from several months in Nepal, and are soon to head to Costa Rica for a few months. They were keen to get involved and offered their support, which I was only too happy to accept. They were valued members of the team, and looked after a few competitors who returned a little worse for wear, but otherwise ok. I had decided I needed a venue that offered accommodation. I had read how British Explorer Ranulph Fiennes had taken part in the overnight High Peak marathon and subsequently fallen asleep at the wheel and crashed into another vehicle. I'm safety conscious and decided I had to offer accommodation too. People would come from a long way away to take part, and sending them straight home would be dangerous. I initially developed a route and approached Gradbach Youth Hostel. However, their communication wasn't that great, they already had a group booking for one of their buildings and parking was a major problem there. So, then I approached Castleton who it transpired were moving their location, from the village centre. 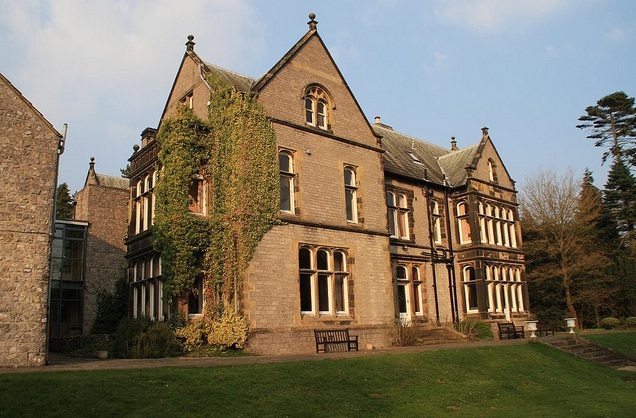 They were in the final throes of refurbishing a Victorian Gothic Mansion, Losehill Hall as the new Castleton Youth Hostel. We saw the venue, it was perfect. The image fitted in with the slightly spooky theme too! I don't think the competitors ever really got time to look around and appreciate the building, it's Lounge and Library etc. It's a fabulous place and the staff have been fantastic. It's possibly the best Youth Hostel that I've stayed in. I decided to use £5 of everyone's £25 entry fee for a Youth Hostel supplied cooked breakfast. The venue kindly agreed to supply breakfast 2 hours earlier than normal, from 5:30am. I think the breakfast was well received by all accounts. As a result of the change in venue, I redesigned some of the route. 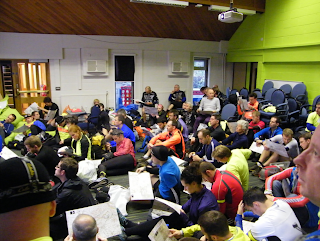 I have done a lot of events in the Peak District, as well as a lot of training, so I already knew some key locations that I wanted on the Route. I wanted the Mam Tor to Losehill Ridge, Cave Dale, Shining Tor, Cracken Edge and the Pennine Bridleway. Joining the dots between them was challenging. I changed my mind dozens of times. Me and Wendy went out and recced many routes, deciding if it would be feasible to navigate them quickly during the night. I had wanted to use the area around Chrome Hill, South West of what was CP2, but it was simply too difficult to navigate; it's a maze of criss-crossing footpaths. I decided that a Dove Head and Cheeks Hill approach to Axe Edge moor was too remote. If the weather was bad, or anyone got lost then getting people quickly and safely out of the area would be a major concern. So, they were out. The key to a good route is to make it interesting, challenging but also to have a good road network between CPs to enable quick extraction of a participant in the event of a problem. I also had to factor in disturbing people in houses and farms all night, as participants came through. So, balancing all of these in the air we finally settled on a route which changed very little in the subsequent months. We wrote to the landowners and took on board their concerns for closing gates, and other than that encountered no resistance to the route. Clearly there is a lot more than went into the organisation of the event, sourcing maps, food, t-shirts, reflective tape, glow sticks, hot and cold drink containers, the wristbands, tokens and a hundred more things. We had set a moderate price with the aim of trying to achieve a profit for Macmillan Cancer Support. By the time you take away the breakfast, OS maps and T-Shirts etc, you are already looking at around £15 spent for the £25 entry fee. Items such as the wristbands, tally cards, finish line banner, and the accommodation for the volunteers was paid for by me, rather than the race. People also donated food, and all of the volunteers have given up their free time, petrol, and all their own contributions of kit, other resources, food and drink. Call it our contribution, but this will mean that the amount we raise for Macmillan is better than it would be, had we deducted all expenses. So, there is a lot that went on in the background that will take too long to explain, and you won't find that interesting. It all got done, that's all you need to know. So, I somewhat nervously advertised the race, unsure if I would even attract 1 person, let alone 90, which I had decided was the limit. We had 45 places for accommodation and we would match that with places for race place only. Entries opened and the first one came in, soon after, followed by the second, third. The entries kept coming in and 4 days later all race only entries had sold out. There was a lot of chatter on the forums and on Facebook, quite a buzz about the race, it seemed to be capturing everyone's imagination. The places with accommodation filled up a couple of weeks after that. The event was advertised 6 months in advance, and of course over that period people got injured, booked holidays, weddings and all manner of things which meant cancellations. We refunded everyone in full up to 1 month before the event (2 months for accommodation fee, which we had to settle in advance). In total, almost 60 people withdrew, but testament to the popularity of the event, all of them were replaced from the waitlist! I decided to organise recces of the route each month from June to September. Two days each month I would lead up to 8 people around 12-15 mile sections of the course. It was great to meet them all, and they all benefits from learning parts of the course. I sent out a monthly newsletter to keep people updates with the latest course information and news. I produced electronic maps of the course, and GPS files for Garmin users. I decided to provide laminated 50k OS maps to all entrants, which I had a printer produce for the event, and was granted a free licence from OS. I also decided to get some glow in the dark silicon wristbands for each participant, which had their race number as well as Dusk 'til Dawn embossed on them. The finish line banner was ordered and delivered. The asked the competitors what food they would like at CPs via an online poll, and did the final shopping a few days before the race. We had quite a few people pull out of the race just a few days before (about 5 or 6), with late injuries, or possibly fear of the Grim Sweeper! Me and Wendy took the day off work on the Friday, the day before the race, and headed out onto the course armed with rolls of highly reflective tape. We had stated that we would only tape the tricky bits, but we taped a great deal more, and as a result the route was very well marked, though a map would still be required. We spent the entire day on Friday taping, and still had to get up at 7am on race day and tape the last few miles. We nervously eyed the weather. It would be unseasonably cold, 7C lower than usual, and would very likely rain in the middle of the night, though the day and early evening would be sunny and clear. Race day was a blur, we finished taping by 11am, and headed back to Losehill Hall to begin preparations. Some participants had already arrived, and some I (or the volunteers) would collect from Hope train station. I spoke to as many people as I could get around, but still didn't manage to speak to everyone. I had emailed all of them over the months, so it was nice to put faces to names. One competitor had flown in with his family from Bahrain, we had 5 from the USA, and also had many participants from the armed forces who had been on recent tours of the middle east, and had trained within military camps on 300m tracks. Amazing stuff. Local club the Goyt Valley Striders had turned out in force and were in all customer made high vis bone tshirts "Goyt Valley Stranglers". All getting into the spirit, of what I hope would be a fun event! The CP staff arrived for their briefing, which Wendy did. Some of them started to prepare some of the cooked food, and heat up the water. At 3:30 registrations opened and I along with the CP staff helped to register everyone. I had decided to put them through a full kit check, which was very wise, given the weather. We ticked off all of their items and handed them a race bag with their map, wristband, a glowstick which was tied to their pack, 4 x wooden tokens to drop at set points on the course and got everyone checked in. We just about got everyone checked in and registered in time for 4:45pm. 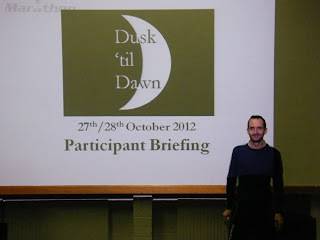 At 4:45 I held a participant briefing in the conference room, which has a projector and a 10ft high screen. I think this was something new for most participants, but something I always planned to do to give participants a walk through of the course and hazards. I introduced out international participants, thanks our armed forces, and explained that we were all here because of Malignant Melanoma. Plenty of spontaneous applause which was really nice. Then, I set to work taking them through a 20 page PowerPoint presentation, punctuated with maps, and pictures to help them navigate. It was a lot of information to take in, but from the feedback it was very well recived and I hope entertaining. We also gave away a £100 1600 lumen headtorch in a prize draw from race Sponsor BrightBikeLights.com, who had come on board quite late. Finally at the end of the presentation I introduced them to.... "The Grim Sweeper", who would be chasing them over the course. I must say that we swapped the 5ft high vintage hay scythe (which I had spent about 8 hours restoring!) for a smaller lightweight version when Clive set off. I hadn't fancied bailing Clive out of jail in Buxton for wielding a deadly weapon during the night, so I thought that was wise. The lightweight scythe he carried had a GPS attached, which enabled us and anyone else to track the Grim Sweeper over the course. The presentation finished just a few minutes over time and we then headed out on the 5 minute walk to the startline. The Grim Sweeper lined up alongside them. In the meantime Wendy and James (Grim Sweeper 3) were heading out to put some of the glowsticks and token collection buckets out. I had everyone snap their glowsticks to light them, spark up their head torches, and I started the race at exactly 17:42, sunset. The night started clear and moonlit and the view up to the hill was amazing. I'm told the participants really thought so too. I'd sent out a couple of marshals for the first mile to keep gates open to prevent bottlebecks. I headed back to the YHA building to gather things I would need for the nights initial Road Trip. I then drove to Hope to act as the first Road Marshal. It was there that I could see a snake of white lights coming down Lose Hill, it looked pretty magical! I had actually arrived a couple of minutes too late to catch the leaders, but assisted everyone else over the road and directed them to the footpath to Castleton. Clive, Grim Sweeper 1, eventually arrived. I relived him of the token bucket, and of the reflective tape he had collected during his sweep, and then got in the car to head towards outdoor CP1, which I have seen by one participant described as "landing strip". We had sets of arnage lights on the road, and several vehicles. By the time I got there, CP1 was in full swing with my father, Tony and Andy all very busy, with the first 10 or 20 already through. I check it was all running ok, and then set off to head for some locations I would place glow sticks. I placed some more tape at a junction where two of our female competitors were stopped wondering which way to go. I put then on track and added more tape. I got a call a few minutes later from a competitor who has in a pub in Peak Forest. Both of his head torches had failed and he had got lost. I turned the car round and picked him up. I did offer to lend him my torch but he decided not to carry on, though was in high spirits and chatted to the organisers into the night! I dropped him at CP1 so they could take him back, and then headed to Millers Dale. I put a few glowsticks to guide people over the road, and across a footbridge and up a climb called Priestcliffe. It is a really stiff climb with a handrail half way up. About half way up I had put a notice which said "Well done, almost at the top! ", then a few metres later another one saying "Just Kidding!". That is my sense of humour for you. I drove around and added more glowsticks at various points, acted as a temporary road marshal for one of our volunteers who was helping out at CP1 and running late too. All the time I was relaying messages between all CP's about people who had retired, so I was a very busy boy. I went to CP2 which was at Earl Sterndale school. They had kindly allowed us to use their school and opened it up from 8pm to 11:30pm. The headmaster and one of the school administrators were both there. Sadly for the few minutes I was there, I somehow managed not to see them, but I did phone up to say thank you the week after. CP2 had some hot water, hot chocolate, tea and coffee, and soup, bread and a whole host of other food, just like the other CPs. Race leader Charlie Sharpe got to the CP 15 minutes before I estimated the fastest person would arrive, but I had the CP setup about half an hour before that as a safety net luckily! nevertheless he still had to tap on the window as they had the door shut! I set off again, added more glowsticks nearby, and eventually caught up with Charlie Sharpe by Buxton Speedway. He himself was speeding. I pulled up alongside and told him I was having to open all the rest of the CPs early because of him! He looked at his GPS watch and had just clocked a couple of 6 minute miles, 22 miles into the 50 miler. Unbelievable! I drove on, finally ahead of the whole field, added more glowsticks and then headed up to CP3 location at the Cat and Fiddle pub. It would be at least 30 minutes before Charlie would arrive, and texted that to CP3 staff Eddie (father) and Tony. I saw my fathers Range Rover outside CP3, so I was happy that it would be setup well in advance. I parked up nearby, grabbed the bucket and associated red glowstick which would be used for the 2nd token drop. I looked at the car temperature gauge, -2, very cold but not rain just yet (23:00). I ran a mile and half (3 mile round trip) up to the top of the highest point on the course Shining Tor, and placed the token drop, then ran back down to the car and drive back to the Cat and Fiddle with about 2 minutes to spare before Charlie arrived. Dad and Tony had been joined by a local guy called Colin who had phoned me up and offered his help. He knew several runners, and so he got to see them as well as help out. 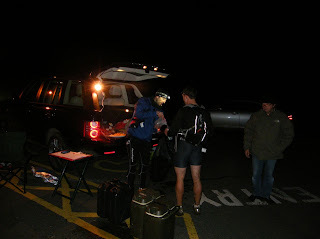 Despite the cold weather, Charlie was still wearing shorts and T-shirt, and would do so all night! He had a head torch and a waist level torch too. He didn't stop for long. I helped him refill his water bottles, he had a few bits of food and then ran on. 2 mins later Tony noticed he had left his race map behind. With the best will in the world, there was no way I was going to be able to run after him and catch him, especially not with with 2 mins headstart! The nest place I could drive to was Pym Chair car park, but it's a knarly slow road to get there. Colin suggested driving down the Goyt Valley. Technically it is a one way road, but there was virtually no chance of meeting any traffic at that time of night, so I did just that and following 20 mins trip, left Charlie's map attached to a glow stick on the moors, on the route near Pym Chair. I texted his phone to tell him so and then headed back to the HQ. I got about an hour indoors, relaying messages back and forth, and then had to go back out to collect some people who had retired at CP3. The weather was now cold and it was raining. Add to that the wind chill up there and it was very cold. We would have used an out-house up there if we had know that other events use it! About 7 people retired at CP3, a couple at CP1, a couple at CP2, and one at a vehicle marshal point where the doctors were between CP2 and CP3. We transported them all back. Due to worsening weather, I had also gave instruction to CP3 and CP4 to offer the participants the option to use emergency "red routes" I had marked on the map, which would avoid high ground. 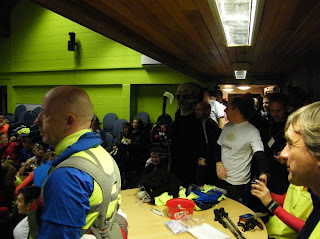 I got back to the HQ, with about an hour to spare before I got a call from Charlie to say he was nearing the finish. We were already prepared having calculated his speed from previous CPs. He came running up the drive and crossed the finish line in 8 hours and 57 minutes. Very impressive! Wendy's sister was the event photographer, and a gallantly stood in the freezing rain and took finishers photos all night. I welcomed everyone, make them some tea and offered them some food to tide them over until breakfast. In total 51 people made it back within the 14 hours and 6 minutes time limit. I had to head out a couple more times to collect people who had retired or who the Grim Sweeper had caught up and retired for their own safety. One chap had got very cold, but CP4 had been setup by Aaron and Debbie, and had an arctic tent, a bed and had arctic sleeping bags and coats as well as a heater! He was put promptly in the bag, and later I collected him along with another participant. I took them both back and had the doctors check him over. His fingers were very cold, but he was otherwise OK. I followed up with a few participants via email to check how they were getting one later in the week. All ok, it appears! The weather further deteriorated, to the point where I had to stop people using the hillls in the last 5 miles, and send them along the road. Tales from early finishers were grim. Freezing cold, heavy rain, sleet, and zero visibility. I stand by the decision to send them along the road, and I don't think anyone would disagree. Although we didn't want to pull anyone off the course in the last 10 miles, ultimately the Sweeper team at that stage (Wendy, Andy and James) had caught quite a few more up and they were told they would be retired at the final vehicle marshal point at mile 45. No one complained as the weather was truly horrible. It was vile to drive in, let alone run in! Everyone who was retired at mile 45 I credited with a technical finish award (Daylight finish). We checked the finish sheet and cross referenced with the last vehicle marshal, and there was one person missing in the last 5 miles. I had stopped as I had drove past him on the road route back, and checked he was ok. He had been fine, and so I was puzzled about how he had got lost? Nevertheless, time ticked by and he didn't appear. I called him mobile number, no signal. We were worried and contacted his wife to ask her to keep trying to contact him, whilst we went out and looked. We set a 15 minute timer going to call mountain rescue (though we last saw him on the road!) and then drove off back along the route. We had barely gone half a mile when there he was running through Castleton. He had missed a turn in the fog and added about 8 miles onto the 50 mile route!!! So, we drove back, and let him run on, and got him in his finishers photo at the end. So, we had got everyone back safe and sound. That was my primary goal. I had arranged for a full English breakfast, plus cereals and toast etc for everyone. It had cost £5 a head but was very well received. Everyone had their fantastic technical fabric T-Shirts which were made for us by ACWorkwear. I eventually sat down and had a little breakfast. I was hungry and dehydrated, and well, really tired. Here is James, Charlie, Me and a few participants who had not yet gone to bed! It was both enjoyable and stressful. Slowly everyone went off to bed or home, and I went and cleaned up the YHA kitchen and collected up the banners, and everything we had taken. I wouldn't get to sleep after all. It took me most of the day, and I didn't leave until about 4pm by which time I was utterly destroyed. Driving home I was more tired than I can remember. Window wide open, freezing cold as it was, radio on etc. We got home at 6pm, I had been up for 36 hours. Pretty soon collapsed into bed. I went out like a light for 13 hours straight. The best sleep I have had in living memory. I spent the next week recovering, doing admin, returning lost property, paying bills and eventually calculating we had raised £1100 for Macmillan. Well done everyone! I was literally flooded with great feedback from the event. Just read down the Facebook timeline here to see for yourself! To know that I had organised something, which had been so well received was gratifying. It was all down to the the help of Wendy and the volunteers who had given their time and money too. Good planning was part of it, but how the participants were treated at the CPs was what made is special. There were 17 in total. We need a few more for a silky smooth operation, which would allow me(or someone) to stay at HQ and manage all of the comms centrally. A we need a few more vehicles on standby to collect people who retire. We coped fine, but better safe than sorry. I was already being asked about next year. I wasn't sure going into the event if it would be repeated, but it was such a resounding success despite the unseasonal cold weather that I have decided to run it again and yet again I intend to run it for charity. However, I can't continue to subsidise it so heavily with my own money. I spent £500 - £1000 I think, not quite sure exactly. So, if I am to run Dusk til Dawn next year in October, then I propose to run other events in the year which will run for profit, but effectively allow me to subsidise Dusk til Dawn and still allow it to make a hefty donation to Macmillan Cancer Support charity. 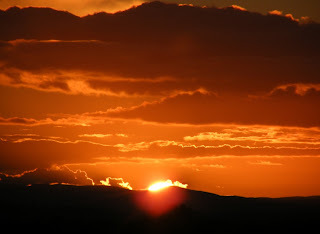 May 18th - Dusk til Dawn: Sunlight. Same course in reverse, but racing until sunset! October 26/27th - Dusk til Dawn. Same as this year, sunset til sunrise! Both events will feature the Grim Sweeper! It is a 24 hour race with 17,000ft of ascent. Participants will have to visit 12 locations in the Peak District, and in some cases return items or perform tasks when they get there. The one and only location that I will reveal in advance (because it is so cool!) is that by arrangement with the owners, is that our Hades underworld checkpoint will be in a well known Cave. The buzz about the new race is already being felt, and I am being asked for advance entry! Between now and Christmas my entire Beyond Marathon website is being redeveloped, and will get a fresh new look, and be compatible with mobile devices too. The website will continue to feature hundreds (currently over 700) ultras all of the world, as well as my own events of course. I have a lot of great ideas for races. For 2014 keep your eyes open for this one. So, there's plenty in the pipeline. Alongside all of that I have a winter of strength training and rehabilitation ahead of me to sort out my SI join problems which have effectively stopped me running more than 15 miles very easily in the last 6 months. I've done a month of yoga so far, I start Pilates next week and am back in the gym too. Not planning on doing much running until the new year, just focusing on core and lengthening my hamstrings and trying to release my back. recent x-ray shows it tilted and twisted, so I have work to do. I'm having a biomachanical analysis with Mark Hines on Dec 2nd in London. Mark is a well known runner and author. He's researching for his PHD and he needs lower back pain sufferrers as test subjects (How fortunate!). Assuming all of that works out I can also begin my 2013 assault on La Trans Aq (May/June), and RacingThePlanet Iceland in August. I've been performing well in multi-day ultras, so I'm keen to keep up the record. I will check in more often now I have more time, and keep you all posted on my event organising and my own running.